Developing biological structure, whether grown in predetermined ways into engineered tissues or through natural organo- and morphogenesis, is a complex and intricate process. Our understanding of many of these processes has been limited by our ability to visualize the cellular and morphological changes that occur over time, as well as by our limited ability to visualize and quantify functional, mechanical, and electrical changes in situ. Advanced research in molecular biology techniques has enabled genetic screening and the development of genetically manipulated animal models. Many of the recent innovations have been directed toward elucidating the genotypical changes that occur in developing biological specimens, with less emphasis on visualizing the phenotypic expression of the normal and altered gene. 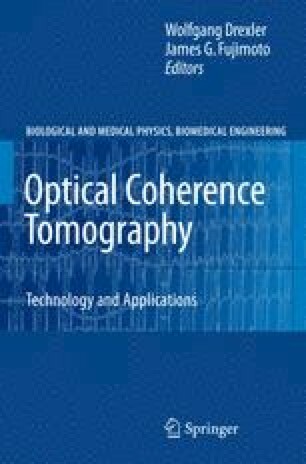 Optical coherence tomography (OCT) is being used as a novel microscopy technique for imaging early developmental events that take place in organisms. In recent years, the unique imaging capabilities of OCT have been directed toward more complex developing animal models such as the chick and mouse. The high-resolution, real-time, noninvasive imaging capabilities of OCT make it ideally suited for monitoring the growth and development of biological tissues over time. This chapter will discuss the application of OCT in the field of developmental biology. An overview of the field will be presented, followed by technical considerations, and then a presentation of published and unpublished studies. A discussion of future directions will also be given. A. H. A. (AHA), http://www.amricanheart.org/children (2004).